Fancy a 680bhp V12 shooting brake? Ferrari’s FF replacement has a configurator. 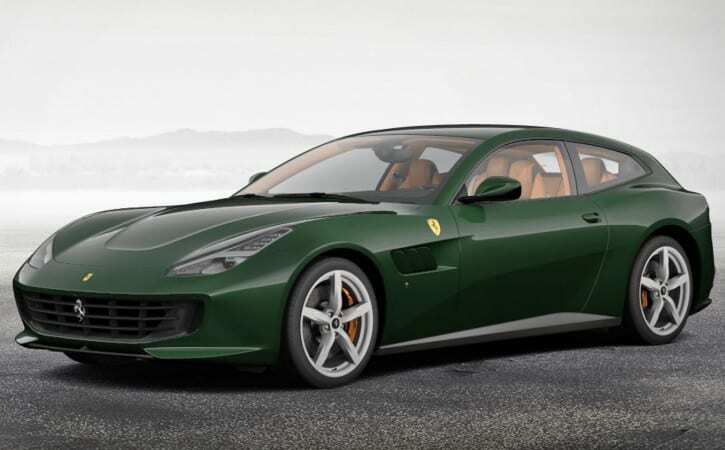 In this spring’s battle of The Big Expensive V12 Super Configurators, Ferrari has hit back at Aston’s opening DB11 salvo with a spangly new visualiser for the GTC4Lusso. Yep, a spacebar seemingly isn’t on the options list of Modena’s hot hatch. Thankfully, all of the bits of the spec that left us goggle-eyed when Ferrari announced the GTC4Lusso back a month ago are fitted as standard. Take the 6.3-litre, naturally aspirated V12. It develops a monstrous, McLaren F1-beating 680bhp, up from 651bhp in the more bijou-named FF predecessor. So quite some hot hatch. Remember to tick the sports exhaust box. Also generously thrown in on the house is the rear-wheel-steering system, designed to make the Lusso more agile in the tight’n’twisty stuff – or negotiating seven-star hotel promenades – and reassuringly stable when approaching its 208mph top speed. In between those two disciplines, you’ll be having more fun, Ferrari reckons. Side Slip Angle Control, the drift-friendly electro-safety net that’s been honed on the 458 Speciale and 488 GTB, has been shoehorned into the Lusso’s four-wheel-drive brain. Well, if you’re going to buy the four-seat Ferrari, you might as well be confident in your ability in showing off to passengers. Speaking of which, TG.com must recommend the optional ‘passenger display’, for real-time petrifying of your front-seat companion via revs, speed and G-force data. So time to spec yours, via this link. We’ve decided to eschew the clichéd red or more sober grey paintwork for a classic mix of British racing green with ‘Cuoio’ beige cabin upholstery, and the least blingy wheels over golden calipers. Rather fetching, don’t you think?